A simple-to-make chicken recipe that is an all-time favorite comfort food at my house! 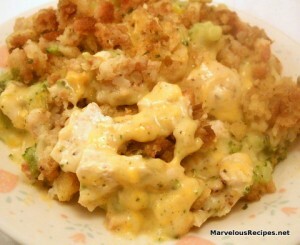 Tender bites of chicken and broccoli in a creamy sauce topped with delicious chicken stuffing! Yummy! 1. Preheat the oven to 400 degrees F. Prepare stuffing mix according to the package directions; set aside. 2. In a 13 x 9-inch baking dish, stir together the chicken, soups, sour cream, cheddar cheese, poultry seasoning, black pepper and broccoli. Top with the prepared stuffing. 3. Bake for 30 minutes or until hot and bubbly. Makes 6 to 8 servings. This is real comfort food, welcome any time of the year. I can almost taste it.